Recessed Wall Standards, 1" Slot. Available in a variety of lengths, our Recessed Wall Standards are built to withstand heavy loads in your retail display settings. 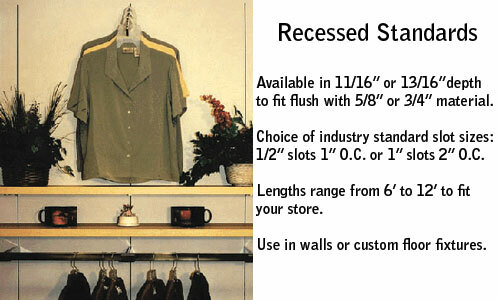 Using recessed wall standards will give you a clean, custom looking display. Use recessed standards to create displays with shelves, faceouts, and hangrails. Recessed Wall Standards feature 1" Slots, 2" on center. Shop our selection of Recessed Wall Standards and Recessed Wall Standard Hardware.